Beyond the stars in the far reaches of infinite space lie multiple universes similar to ours yet unique in their own special extra-terrestrial way ! Planetary systems and star clusters with varied Spiritual Entities just like us are somewhere out there hundreds of light years away. Pleiades is one of these star systems said to be around 500 light years away in the constellation of Taurus, The Bull ! The entire Pleiades cluster is the eye of the bull. The seven stars in the Pleiades star cluster are Taygeta, Maya, Coela, Atlas, Merope, Electra and Alcoyne. The Pleiadians live in the 5th dimension, which is one of love and creativity. Around Taygeta is a planet almost as big as Earth ( 10 % smaller ) called 'Erra'. The Lyrans left their home constellation because of the many wars in their world and consequently found home on Erra with the Pleiadians. This is where they started a new civilization in 228,000 B.C. Traveling though wormholes on one of their scouting missions through space, the Pleiadians discovered what they called Planet Terra ! Better known as Earth by most of us. Dated as late as 225, 000 B.C. 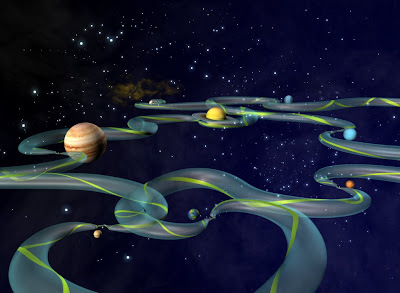 They stayed back and co-habited Earth with the other 3 already present civilizations, hence entering the cycle of incarnation which might just be a very earthly phenomena until you are assigned a new planet, to be born among a strange new alien civilization. Pleiadians claim our earth to be 626 billion years old as per our measure of time. They have a record of the history of Earth's human evolution until this present day. The places designated for the Pleiadians to incarnate were Bali, Samoa, Hawaii and India. Civilizations came and lived on Earth with many wars, peaceful cycles and natural disasters between 196, 000 B.C. and 10 A.D. The Pleiadians stayed with humans on Earth until 10 A.D. guiding humans toward a more spiritual path. In about 10 A.D., the last Pleiadian leader called Plejas left Earth for good for it was time humans evolved on their own. Before leaving Earth, the Pleiadians left a spiritual leader called Jmmanuel, who later was known as Jesus. Jmmanuel was a very evolved soul, whose father was Gabriel of the Pleiades system and Mary who was of Lyran descent. The Pleiadians communicate telepathically hence there are no telephones in Pleiades and language nuances are unheard of. Certain highly intelligent and evolved entities, working in tandem with the divine human consciousness bringing us closer to the dawn of a Golden Era. The Winter Solstice of all time isn't very far, keep the warm clothing handy and gear up for the ultimate adventure through space into a new dimension, a brand new realm of existence you could've only visualized with the mind's eye !!! 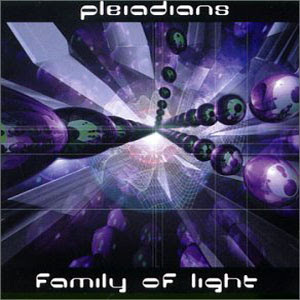 How come the plaedians have the records of human evolution if they weren't here when it happend? You said they encountered 3 civilizations when they came, so we were already a full homo-sapiens? Nassim Haramein : Final Thoughts ... From Crossing The Event Horizon !